Hello, old fellows. I’m back again with your Town & Country recap. This month we have two well-bred beauties on the cover and plenty of nonsense inside, including a back-to-the-Ivy-League packing list that includes an Hermes backpack and $1,000 Gucci loafers. I will say that since I started reading this magazine on the regular again, I’ve become rather – to use a total T&C word – fond of the essays and journalism they print. But that’s not really what I’m here to talk about, so let’s get to my ten favoritest, most Town & Country-est moments from this month’s issue. 1. From a little piece on new American country inns: “‘Our father is French,” Briar says, “so farm-to-table is nothing new here; we’ve always sourced local. '” Oh, okay. But farm-to-table is nothing new here (America) either. I get it, though. I would probably say the same thing to a T&C journalist as I’m sure every question they ask is specifically about “tradition”. 2. Things that unite the rich and the regular folks: L.L. Bean totes, jury duty, Patagonia jackets, DMV trips and pigs in a blanket. As a regular person who is afraid of jury duty and DMV trips, owns an L.L. Bean tote and a Patagonia jacket, and LOVES pigs in a blanket, I am inclined to agree with them. 6. In for Fall: full brows, FLAWLESS SKIN, neutral lips. 7. Jack McCain’s wedding reception was held in the California Academy of Sciences’ African Hall because of his “fondness for Africa”. 8. 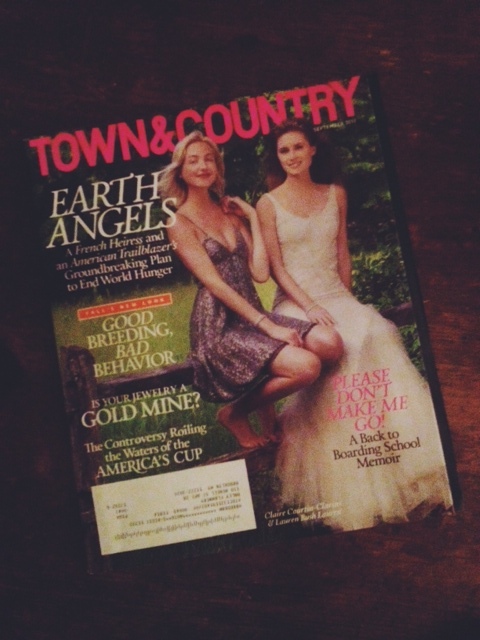 I couldn’t even read the cover story, “Earth Angels”, about Claire Courtin-Clarins and Lauren Bush Lauren’s “charitable alliance” because I was so distracted by the repetition of “Lauren Bush Lauren” and also, in reference to her, “Bush Lauren”. Couldn’t she have just…not taken her husband’s last name? I know I’m not the first person who’s asked this question but C’MON. 10. Max Irons gave basically the same interview to the New Yorker a few weeks ago about the monarchy and his new show, but I’m not gonna complain about the photos of him clad in cashmere and tweed. BONUS: There is an actually great personal essay on boarding school by Michael Lindsay-Hogg.